After 19 Qxg6 Black resigned in view of 19...hxg6 20 Bxf7+ Rxf7 21 Rh8+ Kxh8 22 Nxf7+ Kg8 23 Nxd6 Rd8 24 Re6. This game (for which page 29 of Chernev’s Combinations The Heart of Chess incorrectly put ‘London, 1943’) gives rise to many complications. 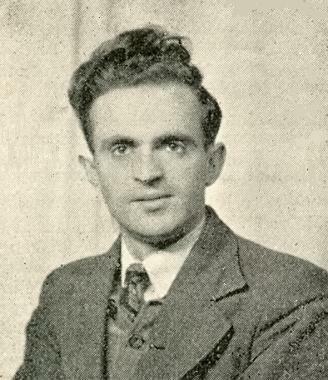 Walter Korn provided the complete game on pages 162-163 of the July 1943 CHESS. The additions within brackets in the game-score are by us. 17...Bh5 18 Rh3 Bg6 (Korn: ‘18...h6 was necessary.’) 19 Qxg6 Black resigns. ‘How then should Black defend against the threat of 18 Rxg4? The pawn capture 17...Qxd4 is strongly met by 18 Re7, while if 17...g6 18 h3. Black cannot reply 18...Bf5 in view of 19 Qxf5! gxf5 20 Ne4+ Qxg3 21 Nxf6+ Kg7 22 Nh5+ and 23 Nxg3, or 21...Kh8 22 fxg3. (This variation from the old analysis was also repeated in a game; 17 years later Kholmov lost in precisely this way to the German master Holtz at the tournament in Dresden, 1956.) And after 18...Bd7 19 Qb3 White maintains strong pressure (analysis by Kopayev and Chistyakov). But perhaps the retreat of the bishop to h5 was not a mistake. Let us analyse other replies by Black, apart from 18...Bg6, which leads to a catastrophe. Black can offer the exchange of rooks by 18...Rae8. After 19 Rxe8 Rxe8 20 Rxh5 (as will be seen later, 20 Nxh7 is better) 20...Re1+ 21 Bf1, and in the opinion of Gligorić White retains the advantage. 21...Nxh5 22 Qxh7+ Kf8 23 Qxh5. 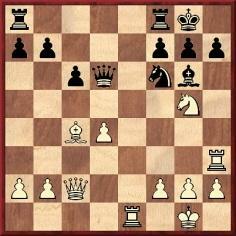 But instead of 21...Nxh5 the “quiet” move 21...Qd5! gives Black the advantage. Therefore the old recommendation of Kopayev and Chistyakov should be considered: 19 Rc1, and if 19...Bg6 20 Qxg6, as in the variation examined earlier. Thus Kopayev and Chistyakov convincingly showed that the immediate manoeuvre of the bishop to g6 is impracticable. 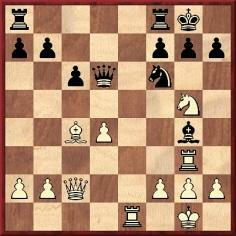 And yet against the threat of 18 Rxg4 there is a defence. In the game Boleslavsky v Moiseev (Odessa, 1949) Black went in for this entire variation, which was considered unfavourable, and after 18 Rh3 he made the unexpected move 18...Qb4! By attacking the rook and saving the queen from the terrible fork with which the combination of Kopayev and Chistyakov concluded (Nxf7+), Black completes the bishop manoeuvre: 19 Rhe3 Bg6 20 Qb3 Qxb3 21 Bxb3 Rfe8. Black has avoided the dangers. After 22 Kf1 Kf8 the players agreed a draw. Neishtadt also referred to Kopayev and Chistyakov’s 1938 analysis when giving the Qxg6 line on pages 129-130 of Queen Sacrifice (Oxford, 1991). 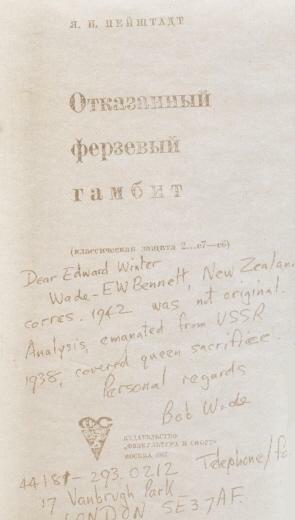 [Walter Korn, for his part, returned to the Wade v Bennett game, mentioning the Kopayev and Chistyakov analysis, on page 106 of Chess Review, April 1967.] In both his above-mentioned books Neishtadt noted that the Qxg6 line subsequently occurred in the game Marović v Chagan (World Student Team Championship in Cracow, 1964). On page 96 of the Lachaga book on Moscow, 1935, Becker said that the 22 Nxf7+ 23 Nxd6 version was also played in Maccioni v Letelier in Santiago de Chile, 1945 and that the 1964 game brought White a brilliancy prize. Afterword: For further information on the Qxg6 sacrifice see pages 214-219 of Kings, Commoners and Knaves and The Fox Enigma. Latest update: 5 November 2011.